“Maybe someday I’ll relax a bit,” says jazz musician Joshua Redman ’91. Development, not relaxation, has long been his specialty. Since his meteoric rise to fame after graduating from Harvard, catapulted by a win at the Thelonious Monk International Jazz Saxophone Competition, his tenor sax has been one of the most influential voices in contemporary jazz. Yet fame has not dulled Redman’s creative energy. He has been releasing new albums consistently, exploring new interests, new compositions, and new sounds. Relax? For this artist, it’s unlikely. The Harvard Crimson: You’re performing in the upcoming Harvard Jazz Bands concert to honor former Director of Harvard Bands Tom G. Everett. How do you think your time with Tom and the Harvard Jazz Bands influenced your playing and your career? 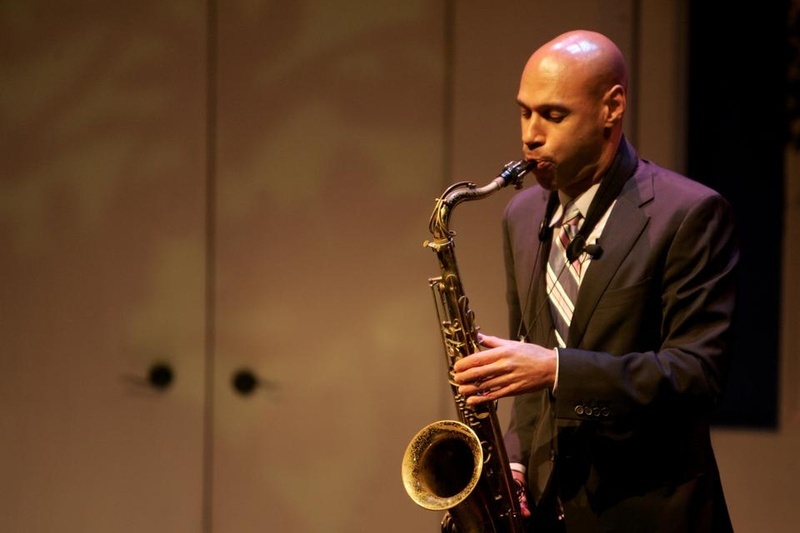 Joshua Redman: The Jazz Band was really the only thing I was doing to keep playing while I was at Harvard. What was nice is that due to Tom’s energy and devotion, it was actually a very good band with a lot of great players. In fact, I didn’t even make it the first time I tried out. When I came to Harvard, I didn’t really have it in mind that I wanted to be a musician. I knew that I wanted to keep playing jazz, and the Jazz Band gave me the opportunity to play every week. THC: It wasn’t until you moved to New York and started regularly doing gigs that you really hit your stride in what has become an extremely successful career as a professional jazz musician. Do you have any advice about navigating the New York music scene for Harvard musicians who might have similar ambitions? JR: I don’t really feel comfortable giving advice, since it’s a much different scene than when I was working there 20 years ago. What I can say is this: you can’t go into jazz wanting to make a solid living or wanting to become well known. Those are just not the reasons that attract people to this music. The people who come to be the most artistically successful and who come to feel the most fulfilled with their work are those with a genuine passion and dedication to this music. Those who start playing professionally based on a desire to preserve and further this music are bound to find their niche somewhere along the line. THC: You have a new release, “Walking Shadows,” coming out this May, which is a record with an orchestral component. What interests you in this particular setting for your music? JR: This new record is a ballads record. About half the tracks have a small orchestra on them, but it’s more specifically a ballads record. That’s the project that I’ve been interested in doing for a while, but I haven’t felt strong enough as a musician to go through with it. The most challenging aspect of performing ballads is how vulnerable you are from an emotional standpoint. You’re really out there and exposed in terms of the emotional content of your expression—ballads require you to really dig deep emotionally and spiritually. So, it took me a lot of practice and experience to reach the technical level where I felt comfortable releasing a record that consists solely of ballads. THC: What does the title mean? JR: I liked that it communicated slow motion. I also liked the mysterious quality that it conveyed, the quality of light and dark, which I think fits this music very well. It’s from the famous Macbeth line, “Life’s but a walking shadow,” although that has an extremely cynical or nihilistic quality to it, which is not really what I wanted to communicate. So in a way, I’m using it somewhat ironically, since this record is really a celebration of life, just like all music is to some extent. I think this dual quality is central to jazz, especially: it’s both a celebration of life, but a simultaneous recognition of its opposite, of mortality and the shortness of life. I think it was this duality that I particularly wanted to convey in this title. THC: With each new project you constantly seem to be pushing your music in new directions. What do you do to maintain this inventiveness and sense of forward motion, particularly in a jazz scene that seems ever more difficult to track as a whole? JR: That’s an excellent question. I think ultimately it comes down to my artistic temperament. I feel like I’m an artist who always likes to keep moving, who always finds a place to improve and expand my playing. Each thing I learn brings 10 or 15 things that I still need to learn. Although, I don’t want to give the impression that my experience of my music is only negative. I think in the actual moment of making music, it’s always a very positive experience, but the process of reflecting on my music is more negative and critical, which I think is part of what keeps me moving like this. Of course, there are plenty of examples of great jazz musicians who found a resting place and stayed there. They spent their careers developing a particular voice and are great and memorable because they stuck with that voice. I just feel like I tend to see room for growth in my playing, so it’s hard for me to settle down somewhere musically. Maybe someday I’ll relax a little bit [laughs]. THC: So what’s your next step after the ballads record? JR: I’ve got several other groups and projects that I’m working with. I’ll be touring with a quartet soon along with a fellow Harvard alum, Aaron Goldberg [’96]. We’ll be playing some of the tracks off the new record, as well as some other music that I’ve written recently. As for where I’m headed next, I’m not too sure. We’ll just have to see. —Staff writer Patrick W. Lauppe can be reached at plauppe@college.harvard.edu.